Sudanese demonstrators gather as they protest against the army’s announcement that President Omar al-Bashir would be replaced by a military-led transitional council, outside the Defense Ministry in Khartoum, Sudan, April 11, 2019. 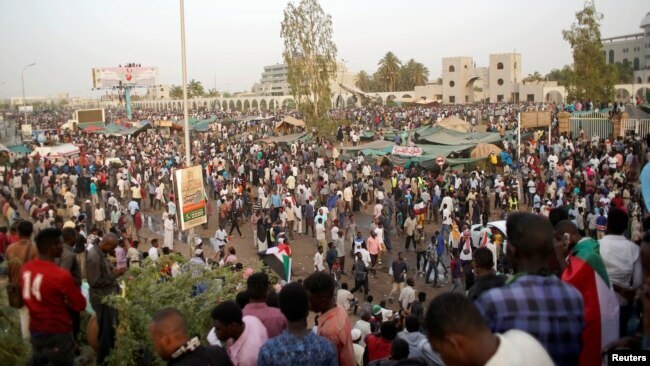 WASHINGTON — Sudan is bracing for a new round of unrest, after its new military rulers said they plan to restore the country to civilian rule, ideally within two years. 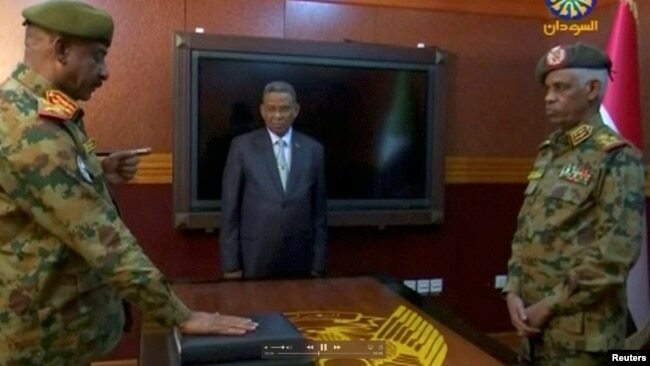 At a news conference Friday, General Omar Zein Abedeen also said the military authorities will not extradite ousted president Omar al-Bashir, who is wanted by the International Criminal Court for war crimes, crimes against humanity and genocide. Protesters in Sudan, who have been demonstrating for four months against the country’s autocratic president, defied a curfew Thursday night imposed after the president’s ouster during the military coup. 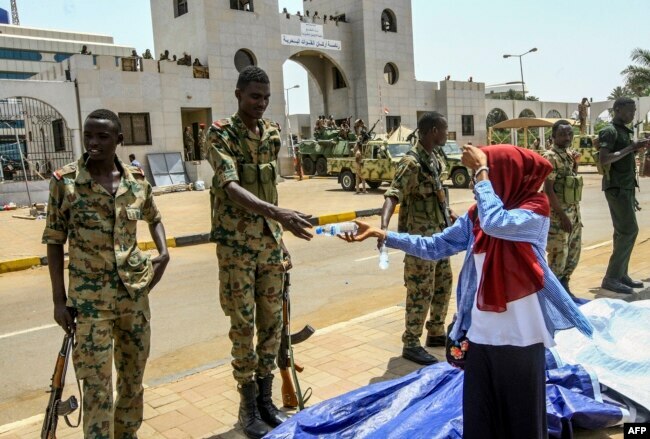 A Sudanese woman hands a bottle of water to a soldier during a rally demanding a civilian body leads the transition to democracy, outside the army headquarters in the Sudanese capital Khartoum, April 12, 2019. Demonstrators say they want civilians, not military leaders, at the country’s helm. Additional protesters are expected to take to the streets Friday, after noon prayers. The European Union called for a “swift” transfer to civilian rule. In a surprise address Thursday on national television, Defense Minister Awad Ibnouf announced that the military had staged a coup, ousting al-Bashir. The minister asked for a return to calm and said the military would close Sudanese borders until further notice and impose a curfew from 10 p.m. to 4 a.m.
Sudan’s defense minister, Awad Mohamed Ahmed Ibn Auf, head of the Military Transitional Council, looks on as the military’s chief of staff, Lt. Gen. Kamal Abdul Murof Al-mahi, is sworn in as a deputy head of Military Transitional Council in Sudan, April 11, 2019. Reached by phone in London, Sarah Abdeljalil, a protest organizer and spokesperson for the Sudanese Professionals Association (SPA), told VOA that protesters have no intention of following the curfew or accepting military rule. 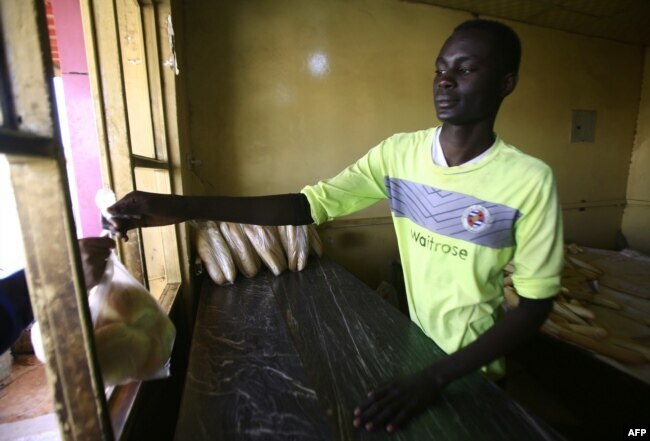 FILE - A Sudanese man hands a bag of bread to a customer at a bakery in the capital, Khartoum, Jan. 5, 2018. Khartoum, and other parts of Sudan, have been hit by shortages of the basic staple. Gallopin believes the Sudanese uprising could follow one of three paths. The government could maintain enough loyalty and military firepower to crush the demonstrations; similar to Tunisia, protests could spur further concessions; or protests could lead to further fracturing and infighting within the regime. Reeves said that, unlike countries like Libya or Somalia, Sudan has a long history of political parties and political institutions. He's hopeful that this history will help the country avoid the type of bloodshed seen in other parts of the world that experienced sudden power vacuums. FILE - South Sudan President Salva Kiir, Sudan's President Omar al-Bashir and South Sudan rebel leader Riek Machar are seen after peace talks in Khartoum, Sudan, June 27, 2018. 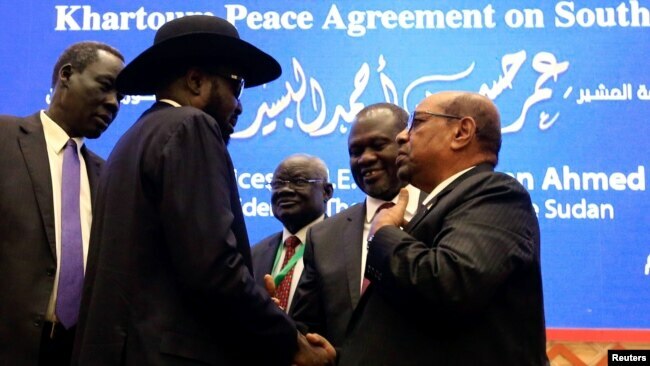 South Sudan's President Salva Kiir and former rebel leader Riek Machar signed a peace deal last year that calls on them to form a unity government on May 12. But key requirements — including integrating their forces — have not been met. "Sudan labored so hard to restore peace and stability and because of that we have the current prevailing peace agreement in South Sudan and it is a guarantor," Martin Elia Lomoro, South Sudan’s Cabinet affairs minister, said in a meeting with international cease-fire monitors.